Connected by flesh and blood these families are sticking together through life’s adversities. In grief, loss and reflection we see them unite to build a new and better future. It's John's first day at school. Unexpectedly his eleven-year-old big brother Mika shows up to follow him to assembly. Instead Mika has plans seeing it as his mission to teach John the hard facts of the world, starting with the merciless demands of the schoolyard. A child’s world is sometimes full of problems that are not always easy to talk about with parents or friends. In the Netherlands, the Kindertelefoon special telephone line helps children – the equivalent of the Czech Child Safety Line. L I S T E N captures the true confessions of these anonymous children. Two siblings begin to reconcile as they perform a DIY funeral for their recently deceased mother, who requested that her corpse be thrown to the wolves when she dies. Three estranged siblings gather round their father’s coffin to mourn and discuss their inheritance. But when a knock sounds from within the casket, the siblings need to decide which is more important... Family, or fortune? After a night of failed new year's eve celebrations, two very different women find common ground after discussing their approaches to risk taking. When Sally's husband is trapped in an underground cave during a diving accident she finds herself trapped in the company of a talkative constable and an unwelcome guest. Watch the best films from 2018’s 48 Hour Film Challenge, where teams write, shoot and edit their films in just two days. This free event is always full of surprises and extraordinary feats of filmmaking! 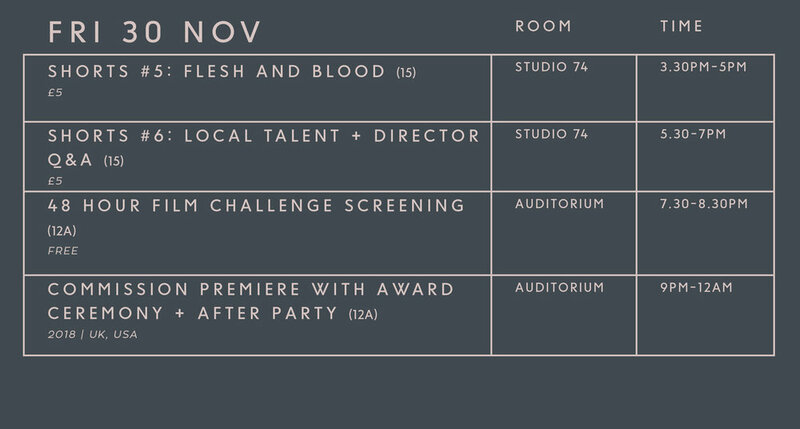 At the end of the screening we will be presenting the Best 48 Hour Film Award, along with the two runner-ups. Cheesy Love, by Taviner Bros.
We will be presenting awards for the festival’s Best Short Film Award and the Audience Choice Award. Join us afterwards in the Café Bar, where DJ Ducky will be bringing us the best film soundtrack classics at the Two Short Nights after party. A man has his reality reshaped by a threat of his own construction. Walks of Life celebrates being in the places that matter most. From Paul's photographic trip around St. Thomas, to Jo and Adam's meditative river walk along the Otter and Cathy's ascent of Rame Head, these varied journeys all have a place in the heart for each walker. Two birdwatchers share a magical ability to turn into birds. When one has to go away, the other must learn to take off on her own. Birdwatching is a mixed-media animation about isolation, independence and rural queer love. Yasmin, an impressionable South Asian teen, finds herself trapped between her strict, traditional family and the man she is in love with. One night, when Yasmin sneaks out to a party, she inadvertently starts a chain of events that changes her life forever. On the day of the EU referendum, an Asian British kid trudges across the British countryside, unaware of the racial tensions and political shifting landscapes around him, as he proudly wears his England football shirt.